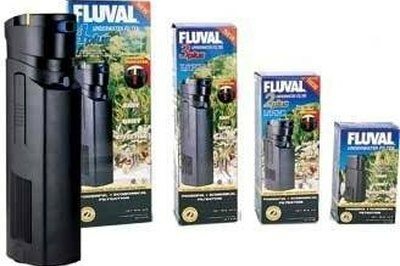 The FLUVAL filter is designed to run in small to mid-size aquariums and offers mechanical filtration of the environment. The installation of these filters requires the consumer to be aware of her needs by having knowledge of aquarium size and density of fish within that tank. This guide will walk users through determining which filter to purchase and the installation and use of that filter in the aquarium. Remove all fish and decorations from the fish tank. Keep the aquarium filled with water. Position the tank to one side of an electrical outlet to avoid water from leaking and causing electrocution. Remove the filter from the packaging and submerge the filter into the water while it's unplugged. If the filter is above the water level, it will not function properly. Secure the filter using the included rim clamp. Tighten the clamp around the edge of the aquarium and slide the filter into the groove positioned on the inside of the aquarium. Shift the exhaust outlet so it points away from the aquarium walls. You can adjust the angle based on preferences. Plug the power cord into an outlet. If the filter is functioning properly, add your fish and decorations back into the tank. Unplug the filter before performing any adjustments to the filter. Make sure you have the right FLUVAL filter. Measure the length of the aquarium as well as the volume of water. Use these guidelines to determine the ideal filter: A 47-gallon tank should be 1 foot long and use a FLUVAL 1 filter. A 94-gallon tank should be 2 feet long and use a FLUVAL 2 filter. A 140-gallon tank should be 3 feet long and use a FLUVAL 3 filter. A 260-gallon tank should be 4 feet long and use a FLUVAL 4 filter. If your fish tank is dense with fish, classified as more than 1 inch of fish per gallon of water, use the next size up of FLUVAL filter. If the filter falls into the tank, unplug it immediately before attempting to retrieve and reattach to the aquarium.